I wanted the first recipe of 2014 to be something healthy, something nourishing, something wholesome. Don’t get me wrong, I have been eating cookies and lollies like a madwoman – the evil of proximity to deliciousness, but now is the time to reign things in a little and focus on eating more of nature’s goodness and less of the buttery, sugary goodness that sometimes takes over my plate. I have been filling my lunch bowl with greens and beans until it overflows, snacking on apples while reading stretched out on my parent’s couch, eating carrots by the bag, and treating myself to sweet and plump dried apricots and prunes before bedtime. When it comes to dinner though, sometimes I need something a little more hearty than a salad. These sweet potato and cottage cheese fritters are plump and chewy and spiced with cumin and coriander and paprika. 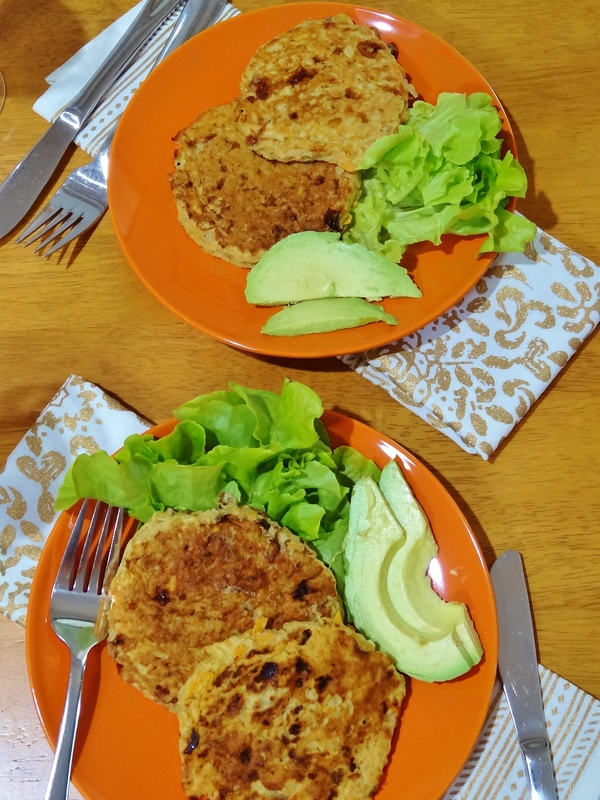 They are high in protein (from the cottage cheese and the egg) and provide a decent amount of vitamin A and complex carbohydrates (from the sweet potato and the whole grain flours used). Most importantly they are high on flavour too. I served mine with a salad and on one night a drizzle of Japanese mayonnaise. 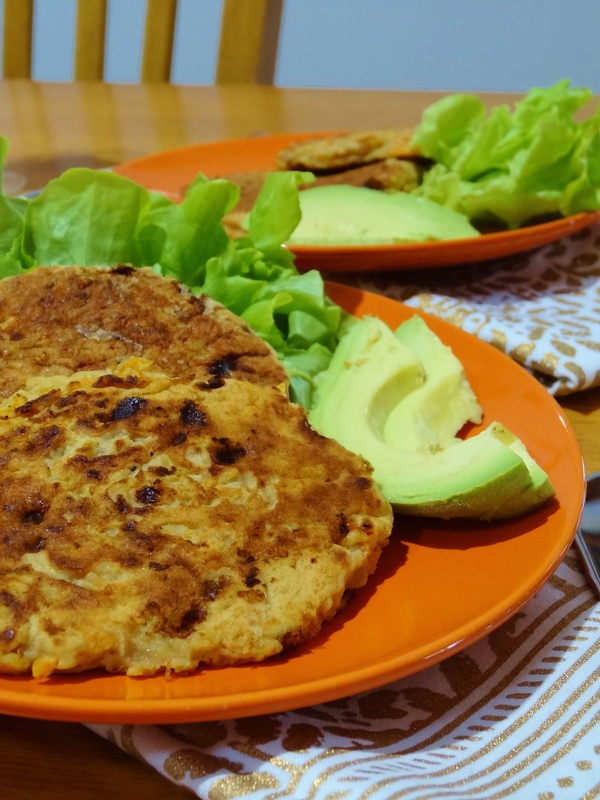 They would also be excellent with a poached or fried egg, and if you are being a little naughty (and are not a vegetarian) a few slices of bacon are always welcome with a plate of fritters. They heat up well and make great lunch box snacks (just make them a little smaller than these ones) for back to school and back to work. Note: If you do not require these to be gluten free, simply replace the buckwheat and rice flours with a total of 1/2 cup of wholemeal plain flour. In a medium sized bowl whisk together cumin seeds, coriander seeds, paprika, baking powder, buckwheat flour, rice flour and salt and pepper. In a separate bowl whisk together cottage cheese, milk and egg. Add cottage cheese mixture to dry ingredients and beat together. Then add grated sweet potato and onion and stir until well combined. Heat a non-stick frypan over medium heat, and grease with a little spray cooking oil. Spoon about 1/3 cup of batter onto the pan for each fritter. Cook until golden brown. This will be about 2- 2.5 minutes per side. Remove from pan to a covered plate to keep warm while you cook the remaining batter. You need to make this salad. You need to make this salad because no one really wants another iceberg lettuce concoction on the buffet table at Christmas time (except the one your Aunty makes because it tastes just like it did when you were a kid). You need to make this salad because when you bring it to a party all spread out on a pretty white platter it looks so festive and everyone thinks you put in way more effort than you did. You need to make this salad because while you are making it you have time in between to shower, find your prettiest party dress, and put on some mascara and shiny earrings. 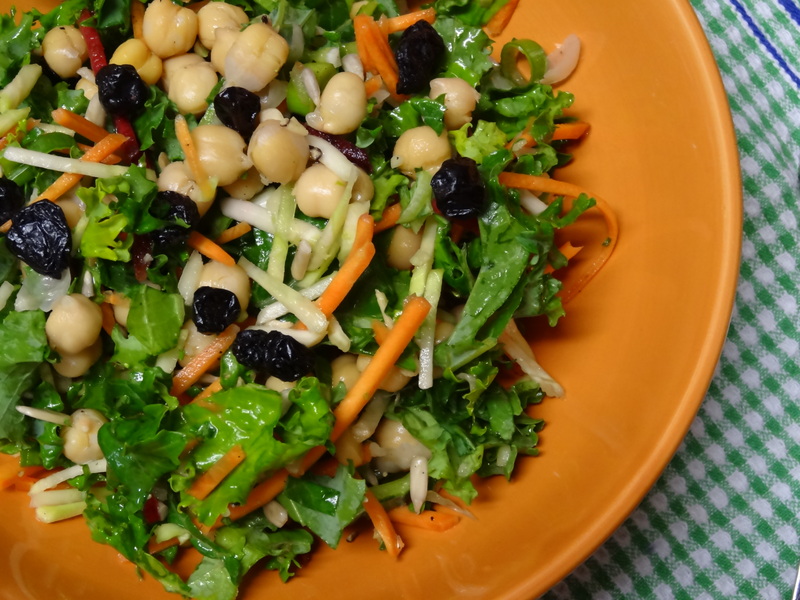 You need to make this salad because between the sweet baked concoctions that abound at this time of year you need to eat something fresh and healthy and equally delicious. 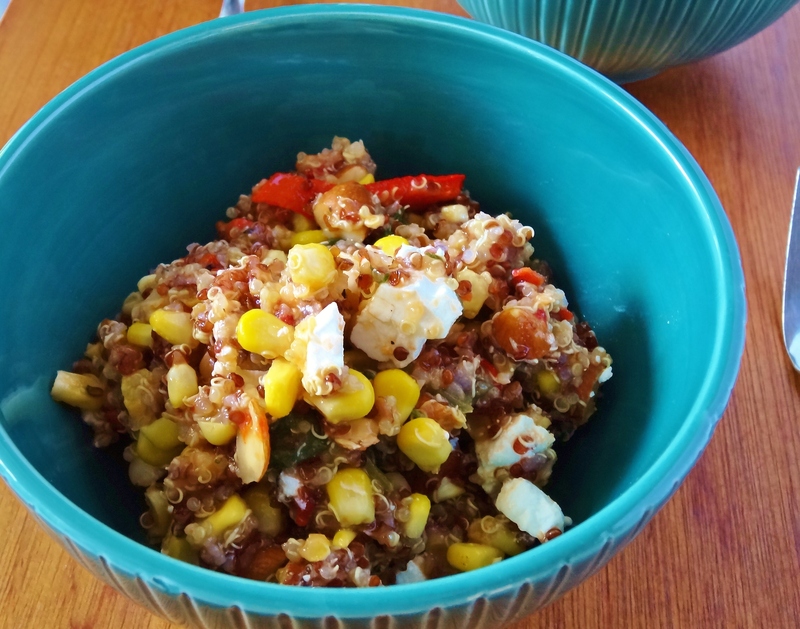 The mix of red and white quinoa is probably unnecessary, but it adds a festive touch, in my humble opinion, and the grilled capsicum and corn a sweet jewels hidden among salty fetta and deeply toasted almonds. You need to make this salad because it will help you keep a healthy festive glow and keep you in fitting into your pretty party dress. And, it makes an acceptable midnight snack when you get in from a holiday party that went exceptionally well. 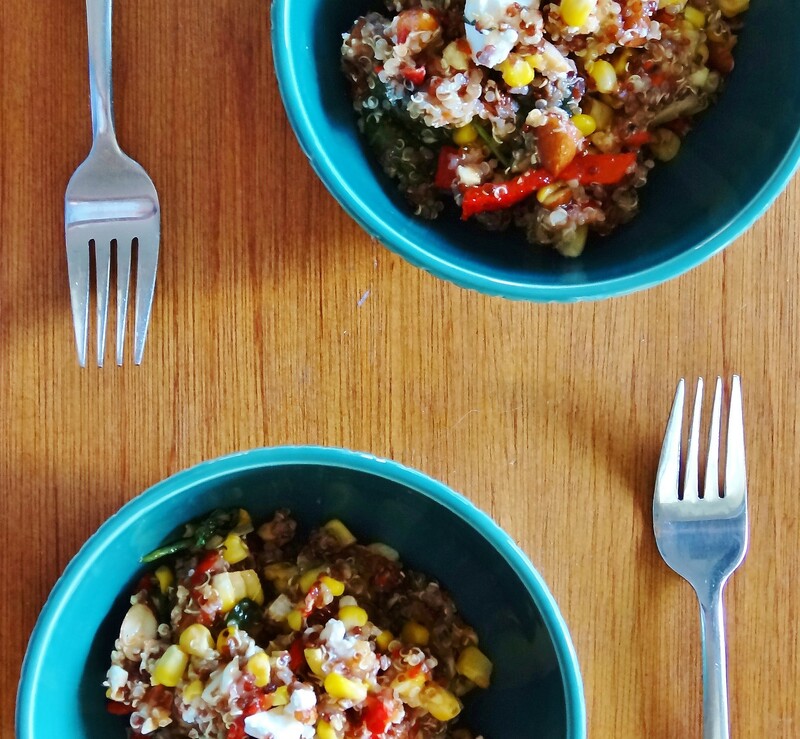 You can of course use 1 ½ cups total of either red or white quinoa instead of half and half. Serves 6-8 as a side dish. This salad will keep for 3 days in the fridge. Rinse quinoa and drain well. Place in a medium-size saucepan along with the water and powdered vegetable stock. Bring to the boil over medium heat then reduce to a simmer and cover. Cook for fifteen minutes. Remove from heat and stand for 5 minutes before fluffing with a fork. Allow to cool completely. Heat a grill plate to high and oil lightly with olive oil spray. Grill corn for 10 – 15 minutes turning regularly until the kernels have turned darker yellow in colour and there are charred spots. Remove from grill and allow to cool slightly. Chop kernels off the cob and place in a large bowl. Meanwhile, remove core from capsicum and cut into four large pieces. Place skin side down on grill with corn until the skin is blackened. Remove from grill and place in a plastic bag for 5 minutes before peeling off the skin. Slice into thick ribbons and add to the large bowl. Heat oven to 180C (356F) and spread almonds on a baking sheet, when the oven is heated toast almonds for 5 minutes. Remove and chop roughly and add to bowl. 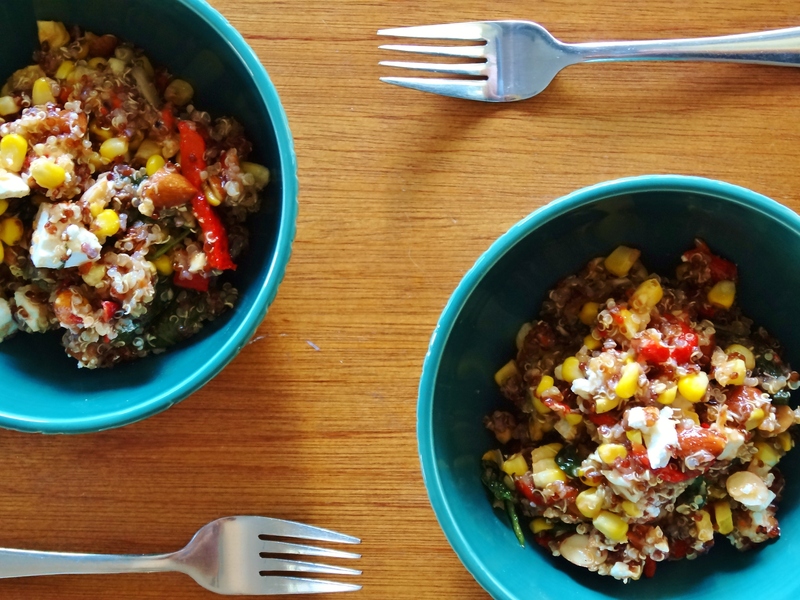 To the corn, capsicum, and almond mixture add the cooled quinoa, baby spinach leaves and red pepper relish. Mix carefully with two spoons. Use a lifting and fluffing motion. For the dressing: whisk together all ingredients and pour over the quinoa mixture. Spread out on a platter and crumble fetta over the top. Serve immediately. PS: You should also make these Spirit of the Season Blondies to take along to the party as well because, more is always more. Warm summer days with plenty of sunshine means tables laden with produce every Saturday at the farmer’s markets. Which, naturally, means that I am enticed into buying beautiful vegetables that I don’t necessarily always cook with, or know how to get creative with. Wandering through the colourful stalls last weekend I picked up a thick curly bunch of kale. Oh kale, purveyor of so much healthy goodness. Held up and praised for its anti-cancer potential, high levels of calcium, flavonoids, fibre, and vitamins C, D, and K – and most importantly for me: high levels of iron. A well-balanced vegetarian diet can provide the daily requirement for iron, but if you have funky blood like I do, which doesn’t absorb iron really well, you need to pay special attention to getting as much iron in your diet as possible. Iron from vegetable sources (called non-haem iron) is helped in its absorption by pairing it with a source of Vitamin C – the technical term is ‘increasing bioavailabilty’. Fancy nutrition stuff, huh. So, I may know about kale’s deep green secrets, but when it comes to inspiration for getting it from my fridge to my belly I need to consult one of my favourite bloggers. Today’s salad was inspired by Tracy from Shutterbean. Tracy lives in San Francisco (my favourite place in the world), takes awesome photos, makes my favourite listen-to-while-running podcast (with her cool best friend), and conjures up amazing food for her family. I have been inspired by (in no particular order) Tracy’s baked donuts, her Instagram feed, and her tasty salads. Tracy knows how to wrangle kale from pretty flower looking stalks into delicious, moreish recipes. 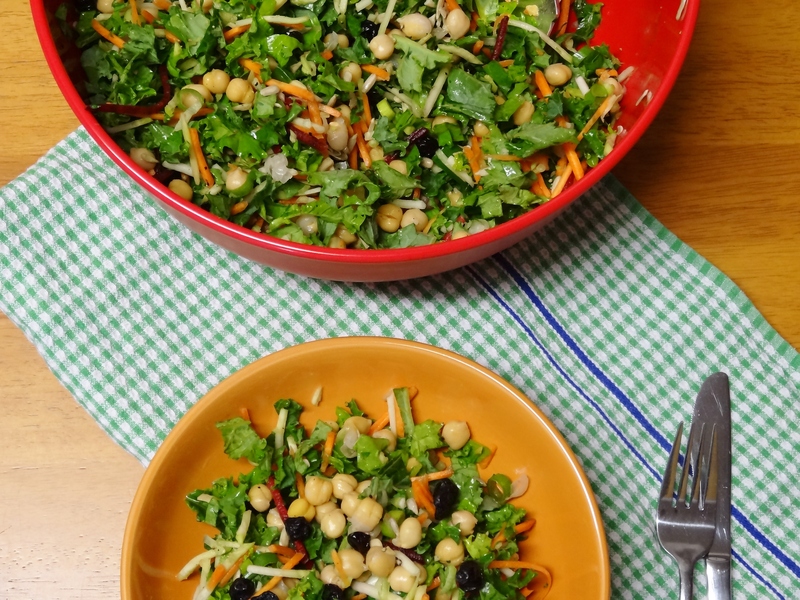 So when I was looking for some Lunchbox Love this week, I was inspired by Tracey’s Broccoli Kale Slaw, which become the Thoroughly Nourished Life Blueberry, Chickpea, and Kale Salad. Serves 4 and keeps quite well for 3 days in the refrigerator. 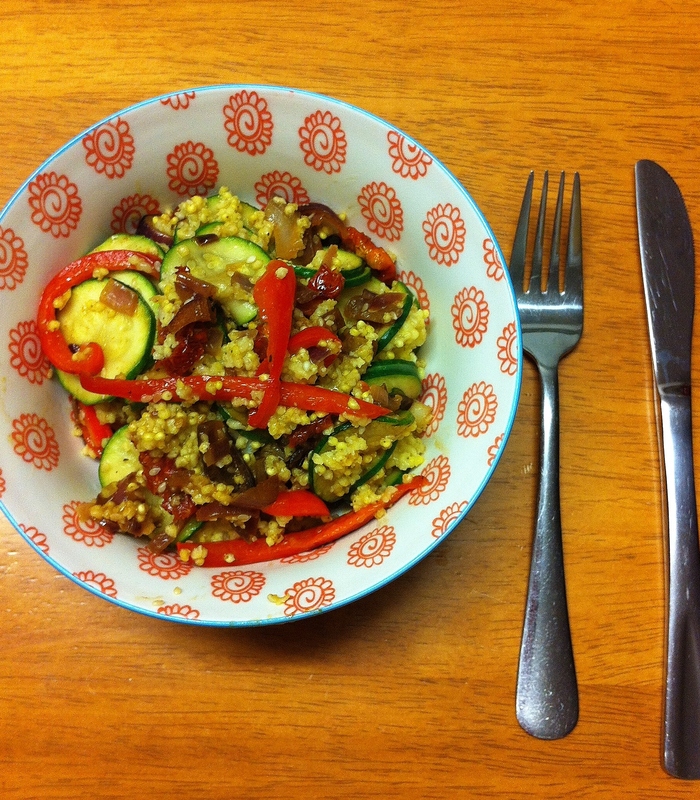 I made this at the beginning of the week and had a delicious, healthy packed lunch all week long. You will need a very large bowl for mixing this salad. This salad can be made vegan too. Just leave out honey, or replace with maple syrup or agave nectar. If you can’t find dried blueberries, you can use dried cranberries instead. I found my blueberries at a health food store. Empty rainbow salad into your very large mixing bowl. Add finely chopped kale, spring onions, blueberries, and sunflower seeds. 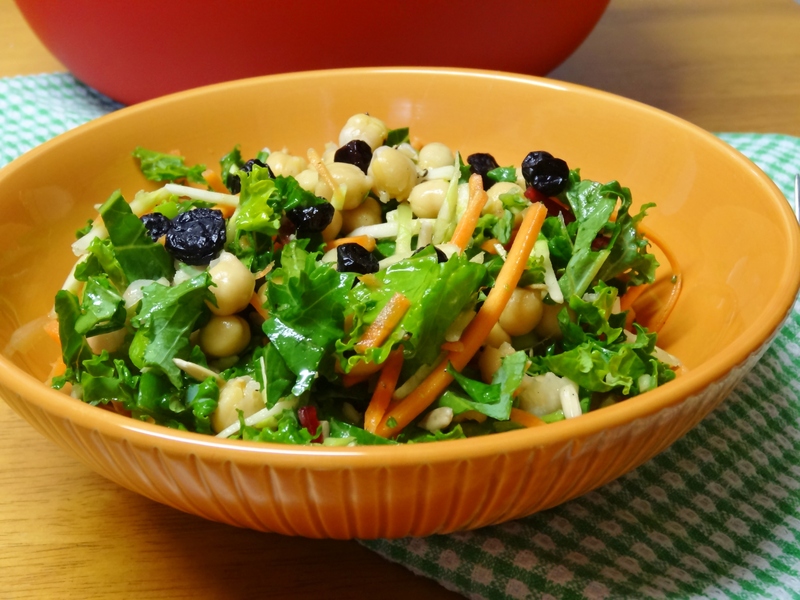 Add well rinsed chickpeas and using salad servers (or freshly washed hands) toss salad to disperse all ingredients. In a small bowl whisk together olive oil, lemon juice, honey, and salt and pepper. Add dressing to bowl and toss very well so that everything is coated in dressing. Serve, or divide between airtight containers and store in refrigerator for up to three days. See – healthy lunches can be quick and easy! Come and be part of my cool lunch crowd, won’t you? I am not going to lie to you. Most nights there are two meals cooked in my kitchen: one for the omnivores and one for me. Sometimes I cobble together something out of parts of their meal, but most of the time I make something completely separate. While I don’t mind this sometimes – omnivores gotta have their chicken wings and ribs after all – I really miss the act of making something that we can all eat and then sharing the same meal when we come to the table. 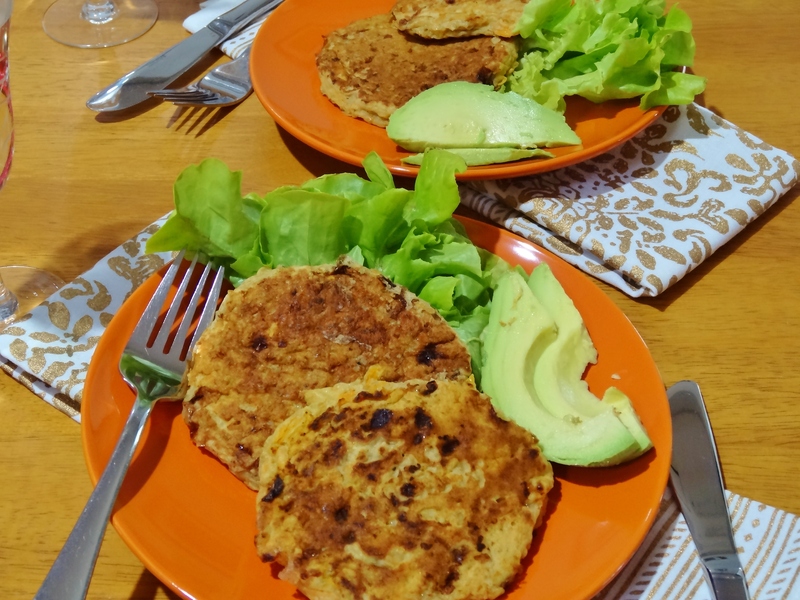 As part of my renewed commitment to focussing on whole-food vegetarian-friendly recipes I really want to start making meals that we can all enjoy: Vegetarian and omnivore alike – one meal with two little twists to suit both appetites. I personally like thinking of these posts as Nourished Me, Nourished You. Perhaps a little too ABBA? Let me know. If you have a better title for it, then I will gladly adopt the moniker. Mum and I found bags of capsicums at a ridiculously great price at our farmer’s market on the weekend. The sweet red veggies were begging for more than just being a second thought in a casserole or a crunchy addition to a salad. They demanded to be the statement piece. 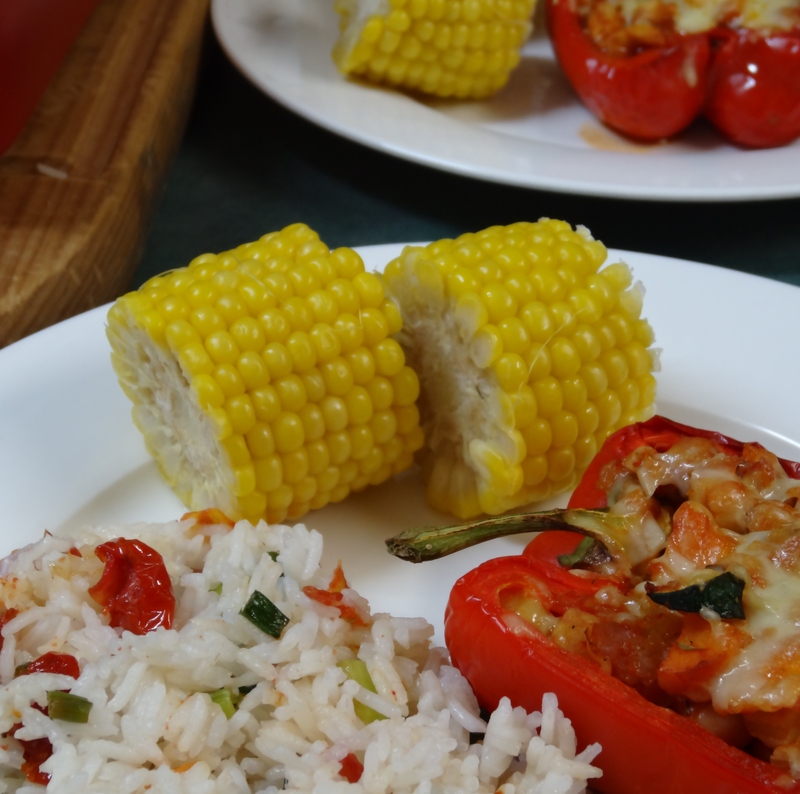 Now, I know I have proffered a stuffed capsicum recipe before, but it is rather simple, and to be honest while it is a lovely side dish it doesn’t have that much punch. 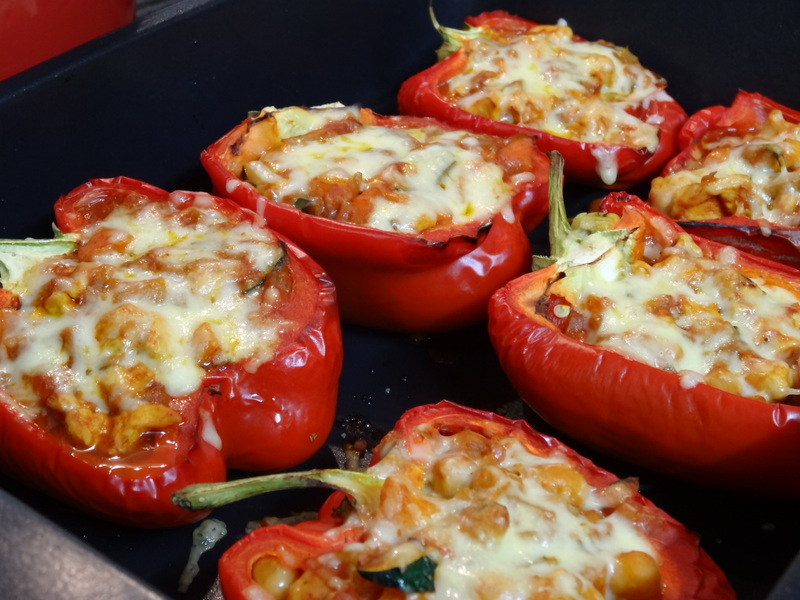 These capsicums are stuffed with either chicken or chickpeas that have been simmered in a tomato and paprika (see, more capsicum) sauce and then topped with cheese. So much savoury smoky flavour. I served ours alongside some rice and sweet early summer corn. Now, you do use two different pots here for cooking the chicken and chickpeas, but after that it’s very simple and everything goes into the oven while you set the table (or put your feet up and make someone else set the table…). Choose capsicums that have tight, shiny looking skin without any soft spots. You can of course cut of the little green stalk before you stuff them, but I think they just look so pretty on the plate as they are. If you are catering for all omnivores, just leave out the chickpeas and proceed with the whole amount of spices, tomato puree and cheese and increase the chicken breast to 500 grams. If you are cooking for all vegetarians, leave out the chicken, and proceed as above with two 400 gram tins of chickpeas. This dish is lovely with rice, pasta, or mashed potato, or a salad for a light meal. These capsicums are also excellent for lunch the next day. Preheat your oven to 200C (390F) and pull out a large oven-proof baking dish and a small and medium saucepan. Cut capsicums in half and remove seeds and membranes. Place capsicums in the oven-proof dish hollow side up and roast in oven for 15 minutes. Remove and set aside until needed. While the capsicums are roasting, finely dice onion, carrots, celery and zucchini. Set aside. Then finely dice chicken breast and leave on board until required. Warm the olive oil in the medium saucepan over medium heat and gently sauté diced vegetables until the onion is translucent. Remove 2/3 cup of sautéed vegetables and place in the small saucepan. Add drained, well-rinsed chickpeas, 1/3 cup of tomato puree, and ½ teaspoon each of paprika and dried thyme. Warm over medium-low heat until the sauce begins to bubble. Add diced chicken to the medium saucepan and cook until chicken is white all the way through. Add remaining tomato puree, paprika, and thyme. Once the chickpea and chicken mixtures are both completed you are ready to fill the capsicums. This mixture will make two capsicum halves filled with chickpeas and four halves filled with chicken. 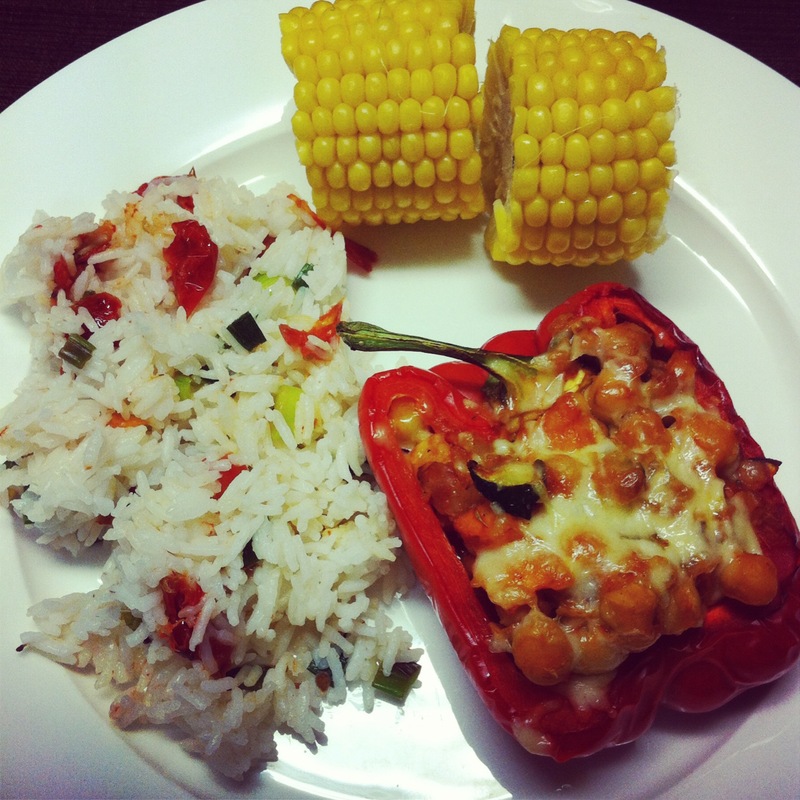 Sprinkle all capsicums with cheese and place tray bake into oven for another 20 minutes. Enjoy with your choice of sides.